Coverage: Red Carpet Show 18:15-19:00 and Preview 19:00-20:00 on BBC Red Button, online and mobiles; Radio 5 live coverage from 19:30-23:00; Live television from 20:00-22:20 on BBC One, online and mobiles; Winners' Hour 22:20-23:20 on Red Button, online and mobiles; Live text online. 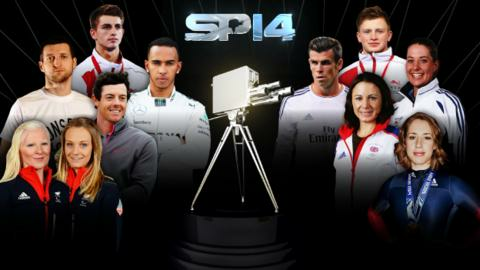 Ten contenders are in the running for the 2014 BBC Sports Personality of the Year award on Sunday. Golfer Rory McIlroy, footballer Gareth Bale, gymnast Max Whitlock, F1's Lewis Hamilton and swimmer Adam Peaty are shortlisted with athlete Jo Pavey. Boxer Carl Froch, dressage's Charlotte Dujardin, skeleton's Lizzy Yarnold, and Paralympic skier Kelly Gallagher and guide Charlotte Evans are nominated. The public vote for their favourite by phone and online during the show. Gary Lineker, Clare Balding and Gabby Logan will present the programme from Glasgow on BBC One from 20:00 GMT, with further coverage on BBC Radio 5 live and the BBC Sport website. The event, taking place before an audience of 12,000 at the SSE Hydro arena, will celebrate a year of drama which included the World Cup, Winter Olympics and Commonwealth Games. Voting details, including phone numbers for each nominee, will be announced during the programme, when people can also cast their votes online. To vote online during the programme, you can register in advance. With an array of candidates to choose from, an expert 12-member panel faced some difficult choices finalising the shortlist. Viewers and the audience will be treated to an event with a real Scottish flavour. Along with band Simple Minds performing on the programme, there will also be live performances from violinist Nicola Benedetti and the BBC Scottish Symphony Orchestra. Last year's Sports Personality winner, tennis star Andy Murray, said: "It has been a sensational year for sport in Scotland with the Commonwealth Games and the Ryder Cup among lots of other major events that have taken place there. "As a proud Scot, it's wonderful that we have been in the position to be able to host so many key events in the sporting calendar. "Scotland did such a superb job of hosting the Commonwealths and the Ryder Cup, and I'm sure it will be no different for Sports Personality of the Year. It'll be a special night for the whole of Scotland and the UK, celebrating some of our best sportsmen and women." One of the biggest music acts of 2014, Clean Bandit, will also take to the stage, joined by singer Jess Glynne.